our guest post today is by molly of my favorite things. molly shares with her readers her beautiful life, her fabulous home, and of course her favorite things on her blog. be sure to check it out! thanks again molly for taking the time to guest post today! Hi readers! I’m Molly from My Favorite Things. Caroline was so sweet to ask me to guest post and I am completely honored. I adore Armelle Jewelry. I actually have on a lovely little necklace as I type. When Caroline asked me to guest post, she left the topic up to me. Eeep! I hate making decisions. So I put it off, and then put if off some more. And then I realized, I better get to writing or I wouldn’t meet my due date! Seeing as Caroline has already given birth to baby number three, I thought I would share a few thoughts on motherhood. I am a mom to three, three fantastically wild, completely imaginative, super cuddly boys. Occasionally I wonder what it might be like to mother a girl but I quickly realize that I was made for boys. My first two boys (Tyler + Benjamin) are 19 months apart. The whole first year of Benjamin’s life was a blur. It was super hard and exhausting. So I waited a few years until I knew I wanted one more. Sweet Nicholas Gray was born last year on Halloween and life hasn’t slowed down. Being a mom to three has made me more confident. Some days I feel like I could conquer the world, where in reality, if I could just conquer the laundry – that would be a small miracle. Motherhood is all encompassing and with each child my heart has grown and stretched in ways I can’t quite describe. Each little guy has woven his tiny spirit into the very essence of who I am. They make me a better person and teach me small things I would never learn, if not for them. But being a mom is hard work and so I thought I would share a few of my favorite newborn essentials that help the transition go a bit smoother. Well, maybe. 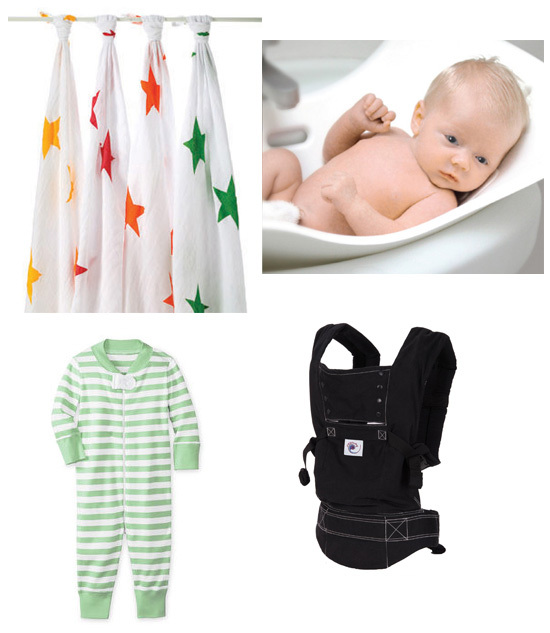 Without further ado – my favorite baby gear. Congrats Caroline! Being a mom to three is exciting. Best of luck on this transition. I agree, we used all of those products for our second and they were life savers! Great advice. Oh, the Hanna Andersson sleepers make me miss my babies. They are so perfectly soft~ newborn heaven. That baby bath tub is the one I wish I had! I have a classic one, and I tell ya, everything cumbersome and awkward about the one I have would be solved with this little one. Oh, and I love green stripes!